This popular Levant-style street food eatery is situated on the ground floor of the Radisson Blu Dubai Marina hotel. The chain was first set up in 2010, and has quickly grown with four other outlets across Dubai and Sharjah, and several more planned in Abu Dhabi, Jeddah and London. Zaroob means “small alley” in Arabic and serves up tasty dishes inspired by traditional street food vendors found across the Levant region. 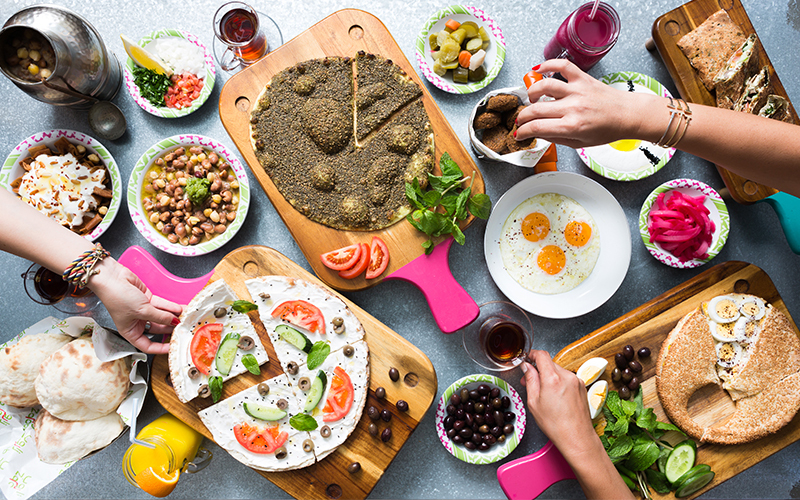 Dishes on the menu are influenced by many different Arab countries from Lebanon and Syria, to Jordan Palestine and Egypt. Recently, the menu has been revamped with several new dishes being added to the list. Including a range of delicious salads, sandwiches and sawanys fresh from the oven. Delicious new dishes include the spinach and watermelon salad, served with blueberries, feta cheese. From the new sandwiches, the meat in the kofta sandwich is grilled perfectly, and served wrapped in fresh Lebanese bread. From the fresh oven cooked sawanys, be sure to try the kibbeh in a pan.The homemade kibbeh is baked with a mouth-watering mix of meat, pine nuts and comes with a tasty cucumber yoghurt. The roasted chicken mousakhan, is well worth a try too. The chicken is marinated and roasted with aromatics including onions, sumac and olive oil, comes with with a side of fresh warm bread. There’s plenty to love about the older items on the menu too. Staples like the falafel, fried halloumi and chicken shawarma were all cooked to perfection. The restaurant’s light Zaroobian section of the menu has plenty of delicious lighter bites, including a tasty light cheese saj and their oat dough with wild za’atar man’oushe. The restaurant doesn’t scrimp in terms of drinks either, there’s a live juice bar serving up a range of tasty flavours including avocado, pomegranate and strawberry, along with hot drinks and fruity mocktails available on the menu. When BBC Good Food Middle East visited the restaurant, service was to a very high standard. Despite being busy, we were seated promptly, and menus were quickly brought to the table by the serving staff. The waiting staff could easily explain the nuances of the different dishes on the menu, and make recommendations about which flavours would pair best, along with retelling some of the history of the different dishes. The restaurant interior is definitely a highlight of visiting Zaroob. The restaurant walls are covered in brightly coloured Arabic graffiti, with furniture including a mish-mash of authentic pieces from the Levant and laidback bright café-style furniture. When BBC Good Food Middle East visited midweek for lunch, the restaurant was busy with groups visiting for a business lunch and families popping by for a quick bite. Details: for more information, visit Zaroob. [AY1]can we mention our light Zaroobian selection somewhere?